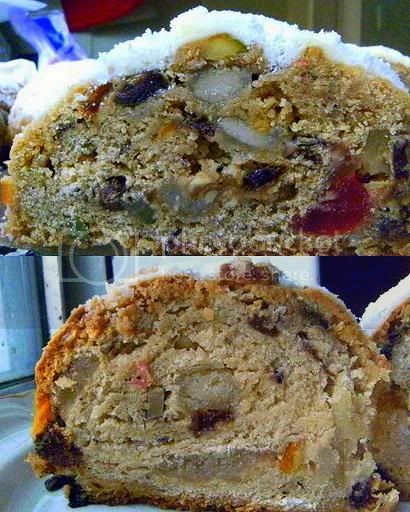 I wanted this version to have a traditional stollen taste on the outside and a more exotic fruit, berry and flower flavour profile in the interior also I made a mild home-made marzipan filling to balance the inside and outside taste profiles. The tradition outer layer was butter coated with vanilla-icing-sugar with a combination of cinnamon, cocoa, cloves, nutmeg, mace, cardamom, fennel seed, and star anise; while the exotic interior dough was flavoured with fig, peach, coconut white chocolate, raisin, orange, lemon, lime, mixed nuts, passion-fruit, wild-sour-cherry, raspberry, blackberry, violet and rose water. I never realised that using fresh yeast really adds such a wonderful taste to the bread it tastes like BREAD the best bread you can imagine. I suggest if you can get fresh yeast do use it and notice the difference. Fresh yeast has good rising qualities and produces excellent-tasting bread, croissants and Danish pastries. 1. I used this recipe to make marzipan http://candy.about.com/od/nougatmarzipancandy/r/Basicmarzipan.htm I added 2 teaspoons of almond extract. It was easy and the marzipan was perfect. I made a half batch and had about 100 grams left over. Next time I will macadamia marzipan that is replace the almond meal with macadamia meal I think that would be great for another variation. 3. I used bread flour (13% protein) instead of Australian all-purpose (plain) flour (11% protein), I think the structure of the stollen was better and it raised better than the lower protein all-purpose (plain) flour I used in the first version. 4. Instead of the candied mixed peel I used candied figs since they look beautiful (a lovely green) and taste so much better than candied peel to my mind. 5. I used the liquid (syrup) from the candied figs instead of the sugar since it tasted delicious. Since I used the liquid from the candied figs I only needed to use four egg yolks (instead of the three whole eggs) this balanced out the extra liquid from the syrup. 6. I used the contents of fruit tea bags (they don't contain actual tea but dehydrated fruit powder cheap and easily available in supermarkets in the health food aisle) instead of the spice mix since I thought the fruit teas would add an extra special touch to the flavour profile of the interior of the stollen – one tea bag of peach and passion fruit and one tea bag of wild sour cherry, raspberry and blackberry. 7. I used four egg yolks instead of the three whole eggs since I had them to hand I think this makes the stollen a lot richer in taste and nicer in mouth-feel. And this balanced out (the liquid/solid ratio) the fig syrup I used instead of the sugar in this version. 9. Instead of the flaked almonds (since I was using a marzipan centre) I used one cup of mixed roughly chopped nuts – pistachios, pecans, walnuts and hickory nuts (yum yum). 10. I added twelve red glacé cherries (roughly chopped) to the dough for the colour and the taste. 11. I soaked the raisins in 3 tablespoons of boiling water with one orange/lemon teabag for a few hours and 3 teaspoons of rum extract then I removed the teabag. 12. I used a small amount of rose water and violent flower extract instead of the citrus extract. 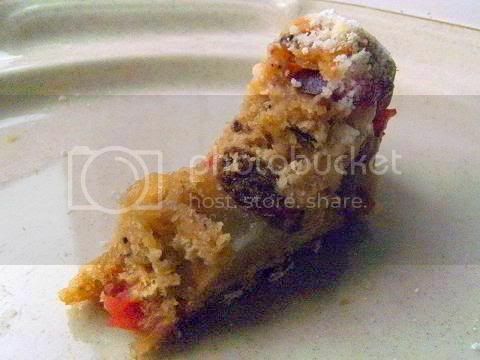 Be cautious flower extracts must be used very sparingly they can overtake the stollen if you use too much. 13. I used the zest of two limes. 14. I used home-made vanilla-sugar, it is very easy to make place a vanilla bean in a sugar container and wait for a few weeks, I always use my used vanilla beans to make vanilla-sugar which is very expensive to buy in the shops. One tablespoon of vanilla-sugar is equivalent to ½ teaspoon of vanilla extract . 15. 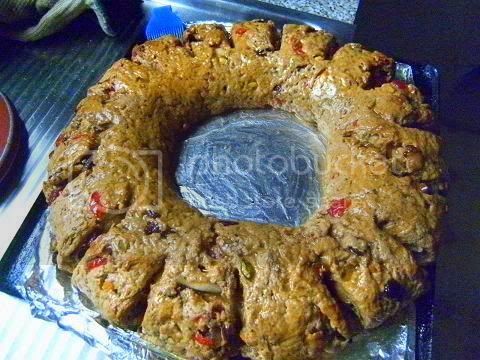 I used melted unsalted butter with rum for coating the hot baked stollen, and used vanilla-sugar with cocoa powder, cinnamon powder, clove powder, freshly grated nutmeg, mace powder, ground cardamom, fennel seed powder and star anise powder to do the final dusting. 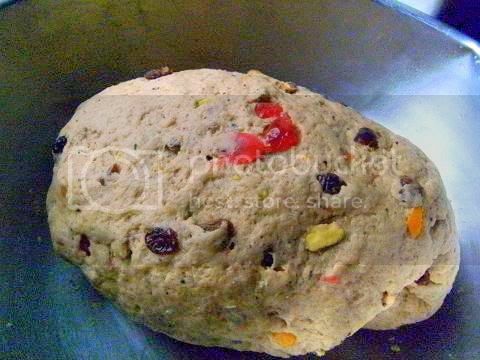 Since I wanted the traditional flavours of the German stollen to be the first taste sensations to be perceived and then the more exotic interior flavours (the unusual fruits, berries and flower extracts used in this version) of the dough ingredients to be detected. 16. The final stollen is totally delectable the traditional coating counterpoints the exotic interior so well a wonderful variation that will delight contemporary palates. I really like how each mouthful has a wide spectrum of flavours firstly you taste the traditional German stollen flavours then you taste the fruit/berry interior and then the soft marzipan filling and lastly the flower (rose/violet) olfactory perception a lovely array of gustatory sensations. I really feel this was outstanding I was lucky I got the various flavour and mouth-feel profiles for the centre, outside and interior parts of the stollen in a harmonious equilibrium of tastes and textures. . The dough after 3 days in the fridge and left out for about 3 hours to get to room temperature. 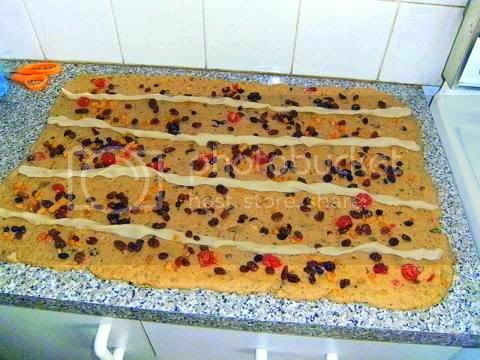 The rolled out dough to 40cm x 61cm (16”x 24”) and about 6mm (¼”) thick it is huge! Notice the rolling pin you get an idea of the size needed. I used 250 grams (9 ounces or about 1 cup) of home-made marzipan that I rolled into four thin ropes I think this method is better than doing one big roll. 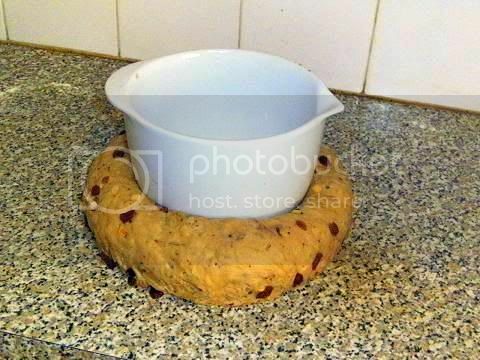 If you use a bowl you can get a perfect circle of dough (neat trick). 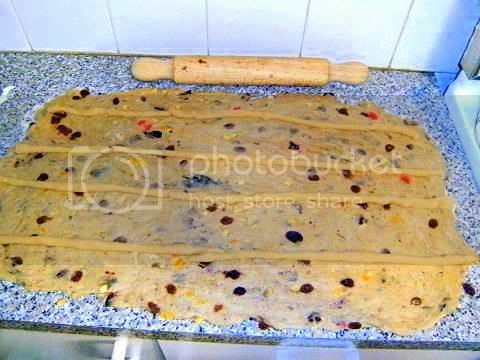 The unbaked stollen shaped and sprayed with oil. 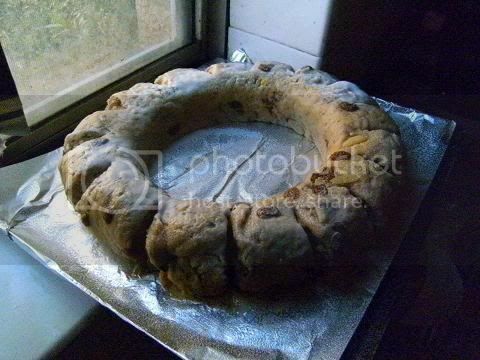 The baked stollen straight out of the oven it is much bigger and a lovely colour. 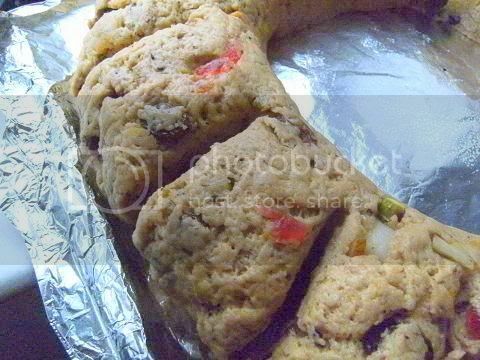 Close up of the baked stollen. 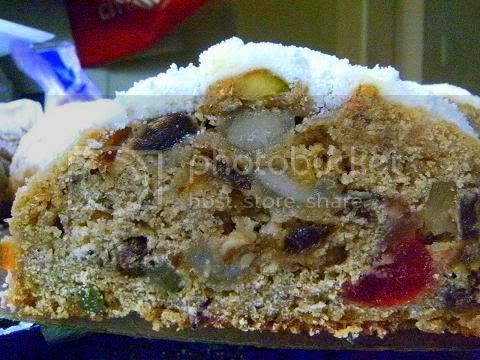 Close up of the cut stollen notice the marzipan layers and the mixed fruits and nuts. 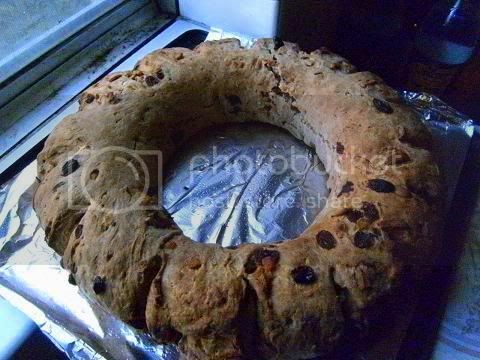 A picture perfect stollen I think it would serve 10-12 easily. The stollen does needs a few days to dry out if you are using marizpan, and surprisingly the stollen isn't too sweet even with all that sugar on top of it. 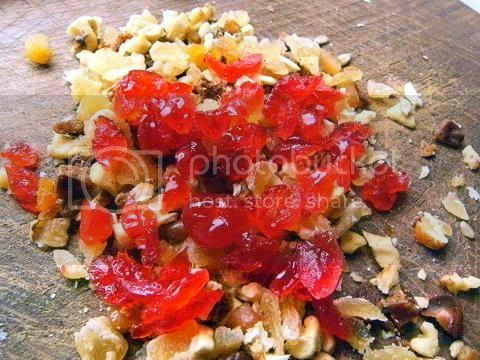 The challenge recipe is so versatile you can easily double or halve the amount of dried fruit/nuts/peel. You can add extra spices if you wish. 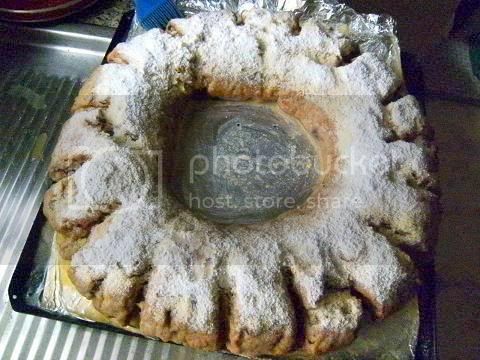 I had an early holiday party to go to on Saturday so I thought I would do an Australian version of stollen for the party it had to feed 40 so I added a lot of extra filling ingredients (about three times) and an extra thick layer of butter and icing sugar (a staggering 250 grams (2 sticks) of butter and 250 grams (2½ cups) icing sugar!!!!). The final baked version weighed a little over 3 kilograms (a little over 6½ pounds). It had a diameter of 33cm (13"). 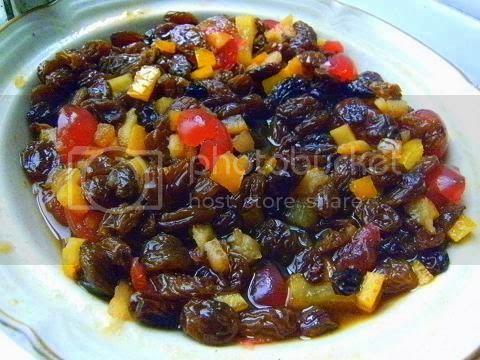 For the bakers who cannot use candied peel and/or raisins/currants you can use dried figs, prunes or other soft dried fruit (like apple, pear, pineapple or banana) for your stollen. 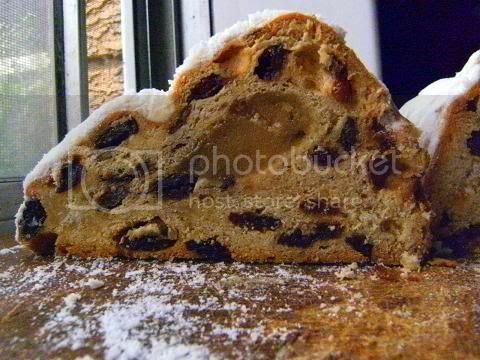 And of course you could use tea, coffee, cola or even drinking chocolate drink to soak your filling for the stollen. I remember when I was in Dublin I have a fabulous fig/prune soaked in coffee stollen that was delicious so don't feel limited to the ingredients listed be creative to your requirements. Christmas in Australia is summer time and to me this means tropical fruits, nuts and stone fruits – especially coconut, cherries, passion-fruit, pineapple, ginger and macadamias, so I decided that my stollen was to have these as its major taste sensations. For this version I used evaporated coconut milk (instead of the dairy milk), I made home-made macadamia mazipan and added a whole lot of powdered passion-fruit and cherry powder to the dough and used a whole heap of chopped red glacé cherries with crystallised pineapple and crystallised ginger with some lemon myrtle to achieve my Aussie Xmas Stollen. 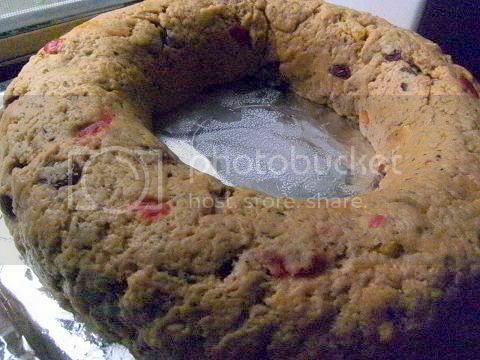 This Christmas stollen is going to served at party for 40 people so I went heavy on the rum soaked filling ingredients and the butter/sugar coating, so a small slice would satisfy the appetite after a heavy holiday meal. 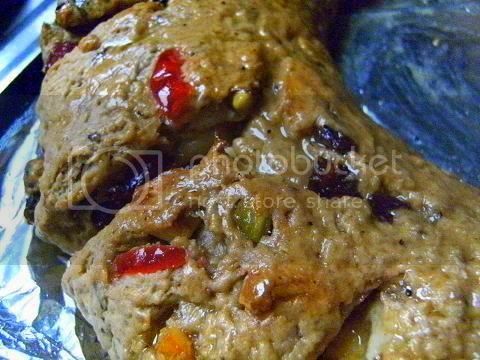 One thing I did notice during the testing of the recipe is that stollen is a dense and somewhat dryish fruit bread if stored for any length of time, it is meant be to be like that, you are meant to butter the slices and drink it with a hot drink like tea. 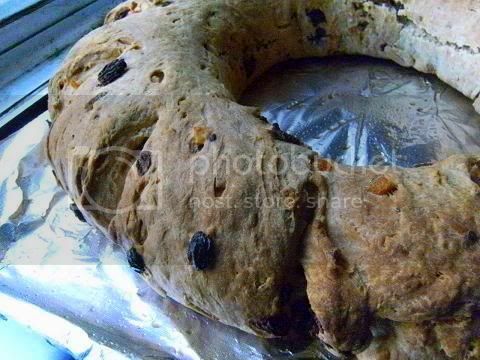 But I didn't think this wouldn't be the way my guests would like the stollen to be served so I searched the internet and my reference books and discovered a simple technique to moisten (and lighten) stollen to suit modern serving styles. So I added the 'moistening' paste to the dough (see note 1 below), I used bread flour and fresh yeast since I think it gives better structure and taste to the baked stollen. I made the lemon and orange citrus peel (using this recipe http://allrecipes.com/Recipe/sweet-candied-orange-and-lemon-peel/Detail.aspx) for the dough (it is infinitely better than the packaged stuff). 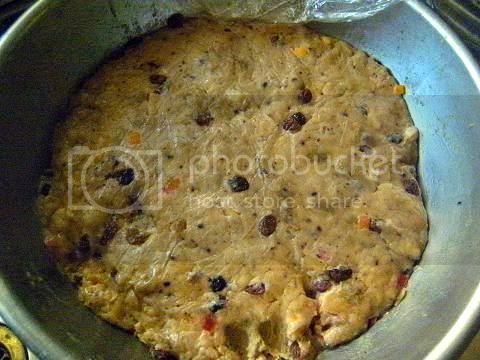 I didn't add the rum soaked dried fruit in the initial mixing of the dough since I didn't like how when I rolled out the dough (during the testing) the fruit etc got squashed flat. I soaked the fruit overnight in lots of rum and orange juice since a long soak gives a better result than a short immersion in the liquor and juice, I added half of the fully-hydrated fruit at the punching-down stage, then I rolled the dough out (which contained half of the fully-hydrated fruit) and placed the remaining half (with the glacé cherries, macadamia marzipan, crystallised pineapple, crystallised ginger and nuts etc) onto the rolled out dough this process ensures the baked stollen will have plump fruit pieces etc when sliced for serving. I made macadamia mazipan using this recipe http://candy.about.com/od/nougatmarzipancandy/r/Basicmarzipan.htm I replace the almond meal with macadamia meal. The resulting mazipan was superb so creamy and tasty so much better than almond mazipan. I cannot believe that making a heated paste of a tiny amount of rye flour with the (coconut) milk makes such a huge difference to the moistness and softness of the dough. It was a joy to work with it was so light and fluffy as compared to the other version I did. 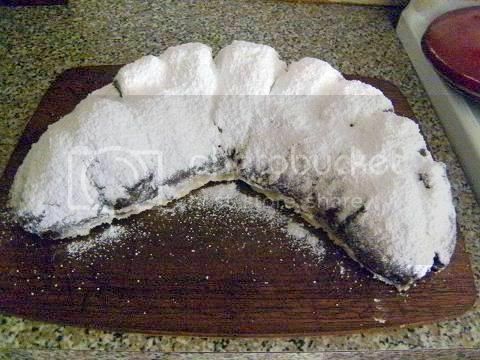 I brushed 250 grams (2 sticks) of melted butter with some rum onto the hot stollen until it had absorbed all of it and then coated it with a heavy dusting of icing sugar, waited for a couple of minutes and coated it again with icing sugar and waited again for about 5 minutes and coated it again with icing sugar and repeated until. After 30 minutes I coated it again. 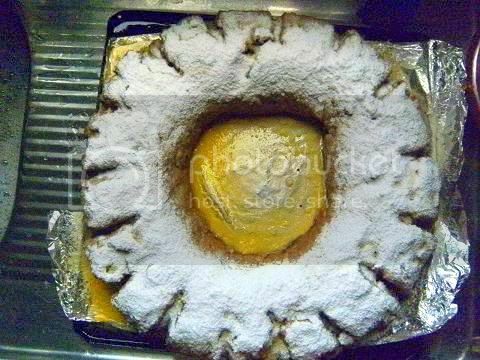 I needed the stollen to store well so I needed a very thick layer of butter and icing sugar. 1. For this version I used a 'moistening' paste which is added to the dough, this is a very easy technique. Reduce the plain (all-purpose) flour by 4 tablespoons. 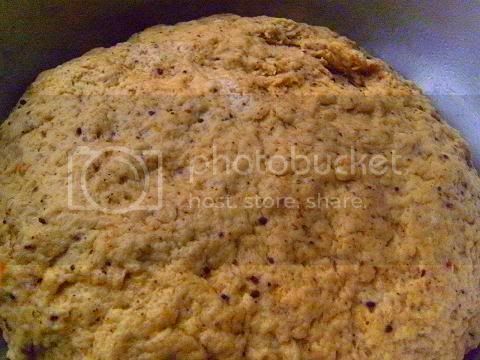 Add 4 tablespoons of rye flour (or whole wheat flour) to the (coconut) milk in a small saucepan and just bring to the boil while stirring constantly take off heat. 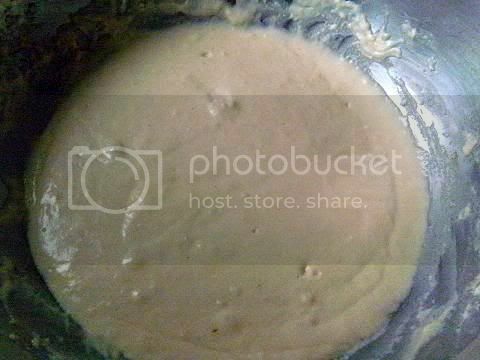 The milk and flour will form a thick paste. Add the butter while stirring constantly let the mixture cool add the beaten eggs and add to the other ingredients and continue with the recipe as written. This paste will keep the stollen moist. 2. I used bread flour (13% protein) instead of Australian all-purpose (plain) flour (11% protein), I think the structure of the stollen was better and it raised better than the lower protein all-purpose (plain) flour. 3. I used home-made candied lemon and orange peel and store-bought crystallised pineapple and crystallised ginger, if you make your own candied lemon and orange peel you will never go back to the packaged stuff there is a quantum leap in flavour and texture and in cost. 4. I used fruit tea bags (they don't contain actual tea but dehydrated fruit powder cheap and easily available in supermarkets in the health food aisle) – three tea bags of passion fruit and two tea bags of wild sour cherry. (I think using fruit tea powders really adds lots of flavour to the stollen and fruit teas are an easy and cheap way to add exotic taste sensations to the final product). 5. I added some rum to the butter coating since I wasn't going to use the rum for anything else. 6. 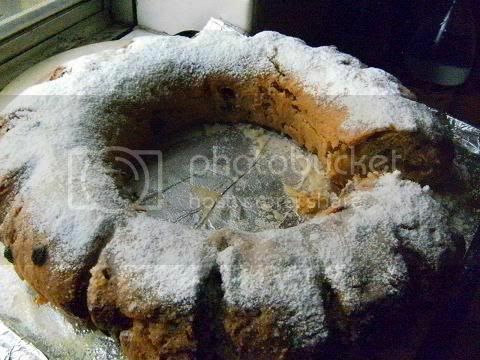 I used 250 grams (2 sticks) of butter to coat the stollen!!! And 2½ cups of icing (powdered) sugar to do the final dusting of the stollen. 7. A big tip is to use a couple layers of parchment paper to bake the stollen and use the paper to help move and coat the final product. The baked stollen is very heavy and can be a pain to handle. After a couple of minutes the butter will colour the icing sugar so you will know it needs another coating of icing sugar repeat the icing sugar coatings until the sugar stays white I needed about 6 coatings since I used 250 grams (2 sticks) of butter. The more butter you use at the start the more coatings of icing sugar you will need. 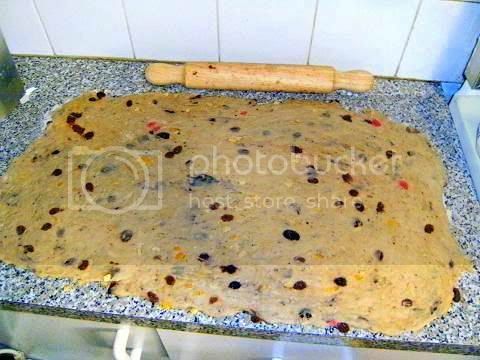 I cut the finished stollen into four sections for easy storage in my refrigerator, when I serve it I will cut each section into ten slices so I will have 40 servings for the party. Each serving will be about 78 grams (2¾ ounces). A comparison of the crumb of the two version – the bottom picture is when you place all of the filling ingredients into the dough and roll it out, the top picture places half of the filling ingredients onto of the rolled out dough also I used the milk/rye paste method to moisten and lighten the crumb as you can see it looks better and it is less dense than the first version I made. 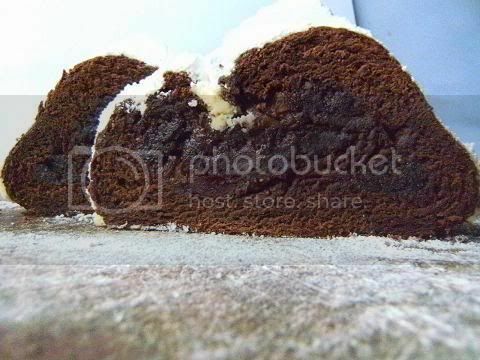 Notice how thick the icing sugar coating is this version. 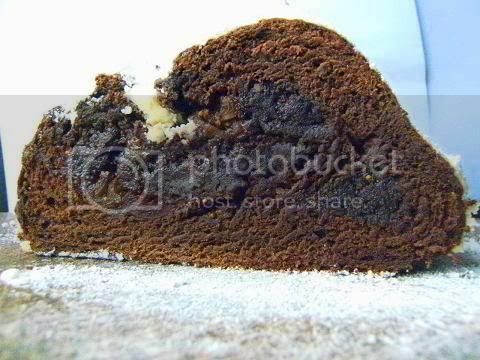 This is a stollen of chocolate lovers it is over the top with flavour, moistness and mouth feel. 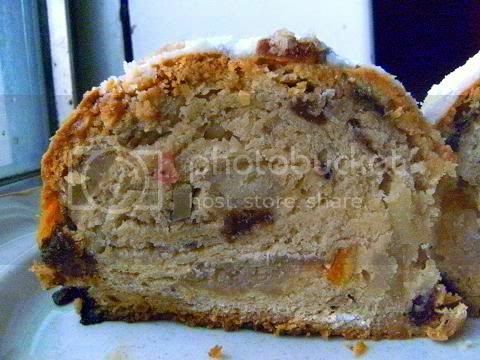 A while ago when I was in Dublin I had a stollen that was a revelation to my taste buds it was the colour of dark chocolate it was flavoured with coffee-soaked fig/prunes and had a hazelnut marzipan filling. I did some experimenting I think I got a very close approximation to it. I halved the challenge recipe and used puréed coffee-soaked figs/prunes as a flavouring for the dough. I made home made hazelnut marzipan. I was amazed how much it rose in the oven I think the figs and prunes are an excellent yeast food so the final stollen rose about three times!!! The colour and mouth feel of the stollen was incredible, you cannot taste the figs/prunes at all they just help to intensify the chocolate taste sensation. Soak overnight the figs and prunes in separate bowls of strong coffee, rum and golden syrup, they should collapse and become a thick paste. Place the yeast into the lukewarm water for 10 minutes. 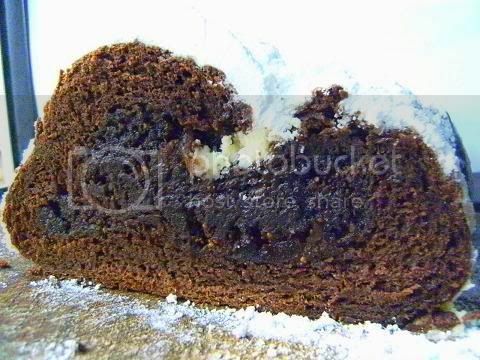 Sift the flour, cocoa powder and salt into a large bowl mix well using a wire whisk. Heat gently the evaporated milk add the butter, chocolate, dark brown sugar, zest and extracts until the butter and chocolate are just melted set aside. When cool purée the figs and prunes add with the beaten eggs to the milk mixture combine well. Form a well in the dry ingredients add the milk mixture and the yeast mixture. Knead for 8 minutes. 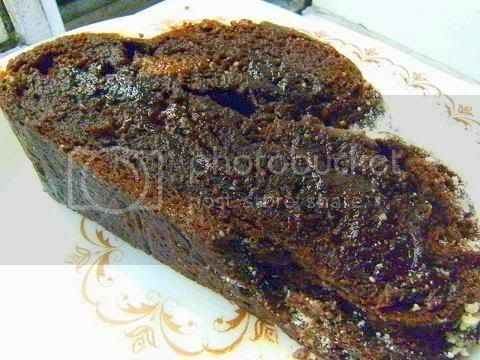 Taste a small piece of the dough for sweetness add more brown sugar if needed. Let rise overnight in the refrigerator. Make the hazelnut marzipan – combine one cup of hazelnut meal and one cup of icing sugar and the reserved egg white, knead together to form a pliable ball (add more icing sugar if needed). 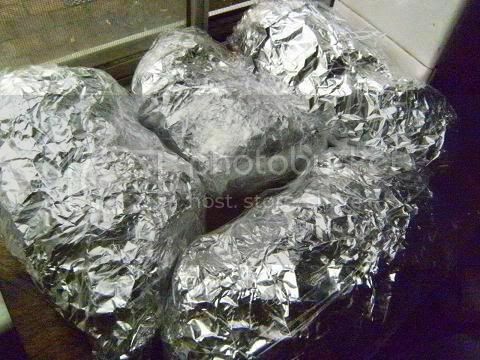 Cover in plastic wrap and let rest at least one hour or overnight. 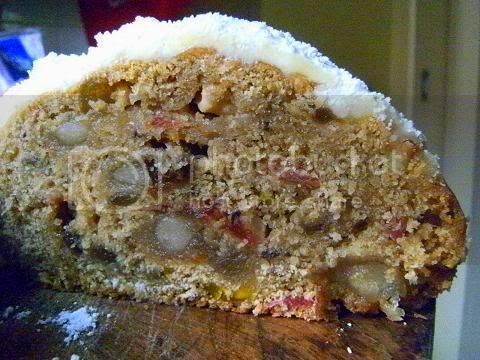 Punch down the dough form into an oblong shape, form the hazelnut marzipan into a thick rope and place onto the dough cover the remaining dough with the chopped cherries. 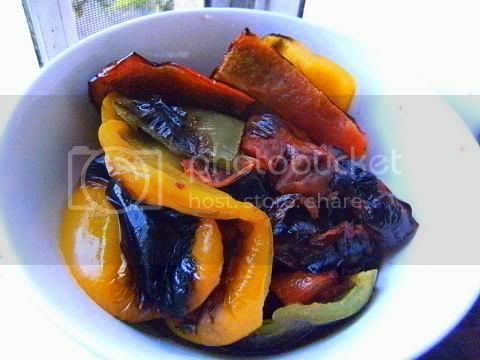 (As an option you can add some chopped prunes and figs if they are soft enough). Form into a a thick crescent shape let rise until it is 1½ times its original size then slash decoratively. Bake in a preheated moderate oven 350°F/180°C/gas mark 4 for 15 minutes then rotate and bake for 15 minutes. 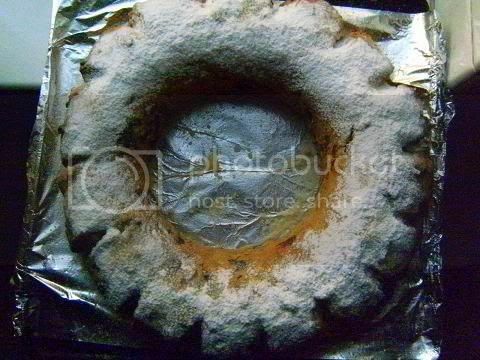 Coat with ½ cup butter (once) and dust (three times) with ⅓ cup icing sugar waiting a couple of minutes between dustings (for a total of 1 cup of icing sugar) while the stollen is still hot from the oven. Let cool and let dry out for a day or two before slicing. I usually add a tablespoon or so of Kecap manis (Indonesian sweet soy sauce), and some chilli powder 1/2 teaspoon to my chocolate desserts and these would go well in this stollen I forgot this time if I make it again I will add them. 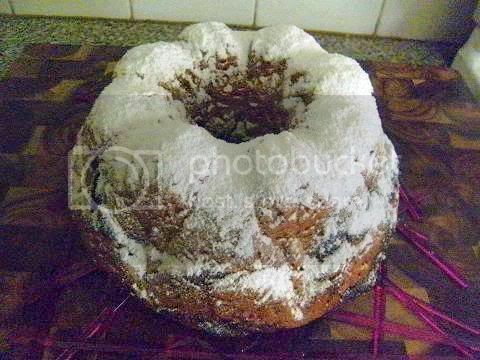 I also have friends who really despite fruit cake etc so I made a stollen just using wild sour cherries as the filling flavour also I used cheery juice instead of the milk in the recipe. 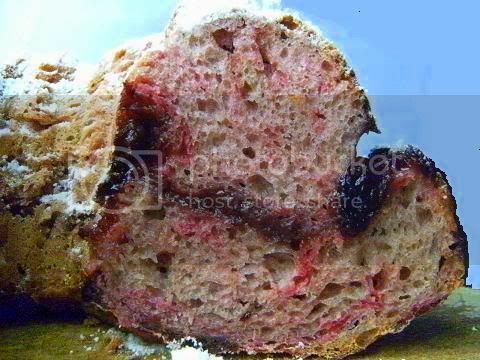 Cherry juice seems to produce a very airy and light stollen. 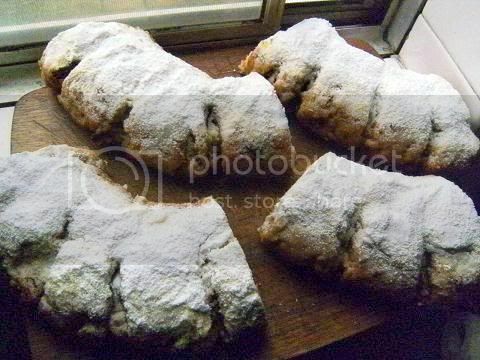 I'm in far North Queensland at the moment on my mum's station (ranch) she asked me to make stollen for the jackaroos (young ranch hands) using sultanas, lemon peel and almond meal as the flavouring ingredients. 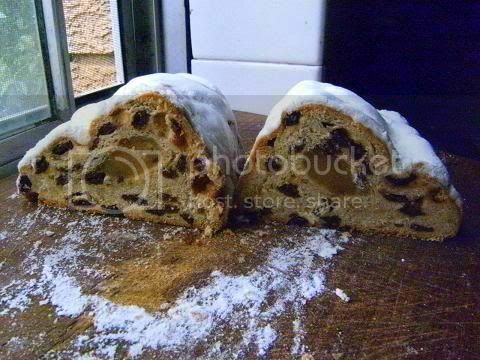 So before I left I made four traditional 2 kg loaves for them and made one small taste-test stollen for me. This worked out so well I thought, so light and tasty, it has a clean smooth taste and the marzipan leaves a lovely after taste. I totally forgot about this version until they arrived in the mail today luckily I had the photos on the laptop already. yes you heard correctly the challenge was to poach anything we wanted and our kind hosts Jenn and Jill provided a number of delicious recipes using poached eggs and a vegan sausage recipe!!! 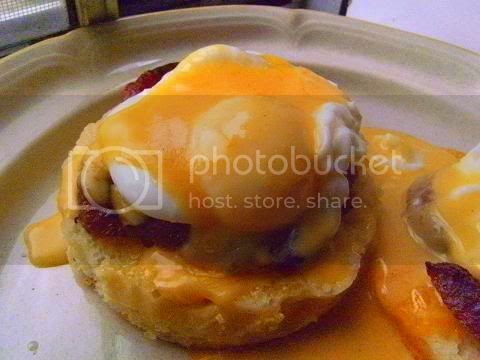 Firstly I did the Eggs Benedict recipe who could resist poached eggs on English muffins with Hollandaise sauce it was delicious and the home made muffin recipe is a definite keeper it is wonderful. Then I decided to really test the limits of poaching and I did two other recipes; Moroccan Merguez Meatball Ragout with Poached Eggs then I did 18 hour slow poached spare ribs. I loved all the recipes and really enjoyed the whole challenge. 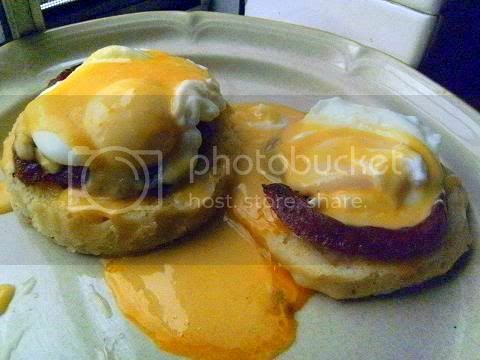 I will be doing the Eggs Benedict recipe again and again the English muffin recipe I have done several times already it is a marvel. The slow-poached spare ribs will be on my special dinner menu from now on. Overall a fabulous challenge thank you so much Jill and Jenn without further ado here our are hosts --- This is Jenn from Jenn Cuisine and Jill (jillouci), and we are so excited to be your hosts for the month of December! We can’t wait to see what you all come up with. For this month, we decided to focus on a technique that seems intimidating to many, but with a little practice it’s really not that hard at all – poaching. All poaching means is cooking something in simmering (not boiling) water. And what more perfect way to practice the skill of poaching than learning how to poach an egg? They can make a tasty breakfast, or salad accompaniment; there are so many different ways to use poached eggs, and they are used in cuisines from a variety of cultures. The 1st recipe is one of the most well known poached egg dishes: eggs benedict – an open sandwich of English muffin, Canadian bacon, poached egg, and hollandaise sauce. This rich and decadent dish can be served as a really nice breakfast or brunch for having company over, and is sure to impress! The “daring” with this dish is in successfully poaching an egg in water, as well as making one of the famed mother sauces of France, the hollandaise. Our 2nd recipe, oeufs en meurette (eggs in meurette sauce), is a classic dish from the region of Bourgogne (Burgundy) in France. It involves poaching an egg in a red wine/stock, which will then turn into a fabulous reduction sauce. 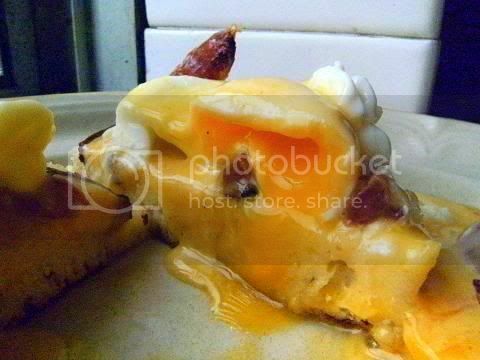 One serves the poached egg on top of fried croûtes with sauce, bacon, mushrooms and pearl onions. 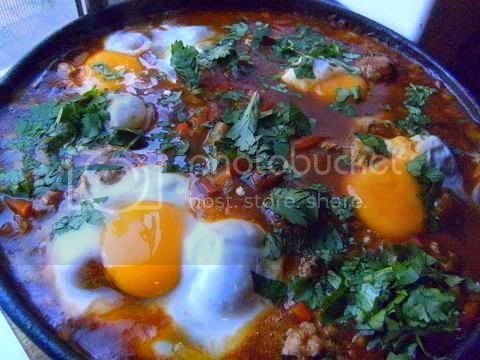 This is also a great dish for breakfast/brunch as well. And don’t worry vegans, we did not forget about you! Instead of poaching an egg, we found a delicious poached homemade seitan sausage recipe that we think you will love! We hope you enjoy this month’s challenge, and have fun poaching! Blog-checking lines: Jenn and Jill have challenged The Daring Cooks to learn to perfect the technique of poaching an egg. They chose Eggs Benedict recipe from Alton Brown, Oeufs en Meurette from Cooking with Wine by Anne Willan, and Homemade Sundried Tomato & Pine Nut Seitan Sausages (poached) courtesy of Trudy of Veggie num num. The differences between; braising, stewing, poaching, simmering and boiling. Braising is a method of slowly cooking large joints of meat, game birds and poultry in a heavy-based covered pan or covered casserole, using a bed of chopped vegetables, which can also include some diced ham or bacon added for flavor. Water or stock should be added to come halfway up the joint. 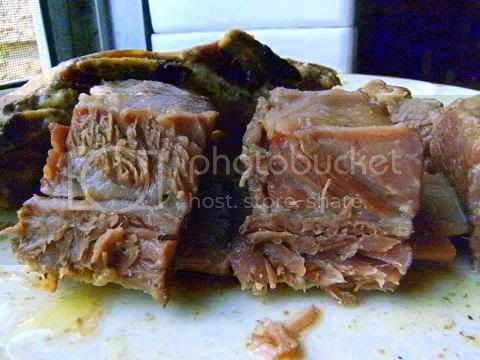 Braising tends to use a slightly better cut of meat than stewing and a whole cut is generally chosen. With braising, the item to be cooked is first seared or sautéed, then partially covered with liquid and simmered slowly at a relatively low temperature. Braising can be done on the stovetop, but it's best done in the oven so that the heat will fully surround the pot, causing the food to cook more evenly than if it were only heated from below. 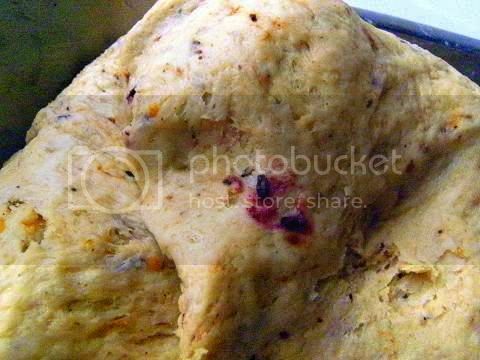 That is the meat is usually fried briefly to brown it first, then placed in a pan or casserole with a tight-fitting lid and cooked either on the stove or in the oven. It cooks gently in its own juices and the steam from the vegetables, which impart flavour. 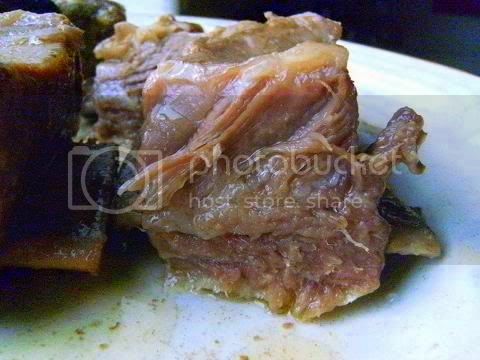 Braising is a good technique for cooking tougher cuts of meat, such as those from older animals, or ones that naturally contain more connective tissues. 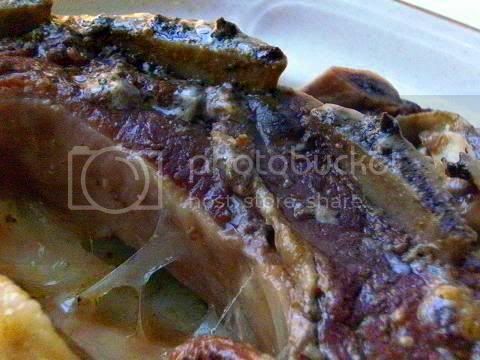 Braising causes the muscle fibres to absorb moisture from the cooking liquid and steam. That gives you a juicy piece of meat. Braising also melds flavours from the stock, vegetables and any herbs and seasonings. 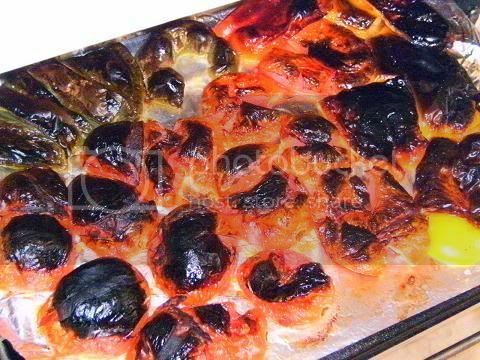 The term 'braising' is also used sometimes to mean cooking vegetables in the oven in a covered dish with a little liquid. For example, heads of celery are braised in vegetable or chicken stock. Stewing is a method in which the added liquid (beer, cider, stock, water or wine) covers the meat and is heated to just under boiling point. This technique is reserved for the toughest cuts of meat which need long, slow cooking, and the meat is generally cut into chunks to aid the tenderizing process. That is stewing is much the same as braising except that the food is cut into even pieces, may or may not be browned, and is cooked in enough liquid to cover. Poaching, simmering and boiling are really three different stages of the same cooking method moist heat cooking. Each of these methods describes cooking food by submerging it in hot water (or another water-like liquid like stock). 140 degrees F to 180 degrees F. (60 degrees C to 82 degrees C.) Some sites have slightly different ranges for poaching these figures are the most popular. Poaching refers to cooking food in liquid that has a temperature ranging from 140°F to 180°F (60°C to 82°C). Poaching is typically reserved for cooking very delicate items like eggs and fish. At poaching temperatures, the liquid won't be bubbling at all, though small bubbles may form at the bottom of the pot. Poaching is "to cook an item by submerging it in a liquid that is just barley simmering." Poaching is not a rolling boil. Poaching, compared to boiling, is a much gentler technique. Poaching generally calls for food to be fully submerged in a liquid that is kept at a constant and moderate temperature, between 140° and 180°F. Keeping the temperature constant can take a little practice. The surface of the liquid should just shimmer with the possibility of a bubble. The liquid is generally well flavored - stock, broth, court bouillon infused with herbs, spices or anything the imagination can conceive. Usually the most delicate of foods, like eggs, fish, fruit, and some organ meats are poached. The food must be completely submerged in the water. 185 degrees to 205 degrees F. (85 degrees C to 96 degrees C.) Some sites have slightly different ranges for simmering these figures are the most popular. Simmering is distinguished by cooking temperatures that are a bit hotter than with poaching — from 185°F to 205°F. Here we will see bubbles forming and gently rising to the surface of the water, but the water is not yet at a full rolling boil. Because it surrounds the food in water that stays at a fairly constant temperature, food that is simmered cooks very evenly. It's the standard method for preparing stocks and soups, starchy items such as potatoes or pastas, and many others. One of the downsides to simmering is that vitamins and other nutrients can be leached out of the food and into the cooking liquid. Simmering is usually reserved for tougher cuts or items that need more time to cook. The temperature of the liquid is usually between 185°F and 205°F. A simmer is sometimes called a "gentle boil." Small bubbles periodically rise to the surface - the gentler and slower the bubbles, the lower the temperature. NOTE: You can simmer with a lid, but remember the temperature inside the pot will rise and the simmer can very easily turn into a boil. The simmered item renders a broth that is served as the sauce with your dish. Boiling is the hottest of these three stages, where the water reaches its highest possible temperature of 212°F (100°C). It's actually the method that is least likely to be used in cooking. That's because the violent agitation caused by churning bubbles characteristic of a rolling boil will often damage the food. Boiling would be a bad choice for cooking an egg outside its shell, as when preparing poached eggs, because the agitation would basically destroy the egg. The same holds true for pastas and delicate fish. Boiling food is the process of cooking it in a boiling liquid, usually water. Boiling water has a temperature of 212°F (100°C), and no matter how long it boils or how hard it boils, it never becomes hotter; for at that point it is transformed by the heat into steam, and in time boils away. This temperature varies with the atmospheric pressure, which in turn varies with both altitude and weather. 1. Use the freshest eggs you can obtain (less than one week old is best), in old eggs the whites thin out and become separate from the yolks making poaching very difficult. Whites of fresh eggs will gather compactly around the yolk, making a rounder, neater shape. 3. Make sure that the pan is deep enough (at least 3” or 75mm) and that the water covers the eggs. 4. Crack each egg into separate bowls/ramekins. Discard any bad eggs and the eggs where the yolks have broken open. 5. Bring the water to a temperature of about 160 to 180ºF (71-82ºC ). Do not place the egg into boiling water which will produce tough whites if the water is too cool the whites will separate from the yolks..
6. Adding an acid (lemon juice or vinegar) helps to congeal (not toughen) the whites faster helping to form a well shaped poached egg. Do not add salt which loosens the whites and forms loose shards of protein around the yolk. 7. Slip the egg from the bowl into the heated water by lowering the lip of the bowl ½” (15mm) below the level of the water and let the egg flow out slowly. 8. You can contain the egg by using an egg ring or a tuna can (with no top or bottom) by dropping the egg over the ring and let the egg settle into the ring. Use a small teaspoon to help gather the whites closer to the yolk. 9. Or you can use plastic cling wrap, place a piece of cling wrap over a cup or mug carefully slide the egg onto the plastic wrap then tie and twist the ends of the plastic together tightly and place the contained egg into the heated water. When cooked remove the plastic and serve immediately. 10. Cooking for three minutes produces medium-firm poached eggs. 11. Use a slotted spoon to remove the poached eggs, drain well for about 15 seconds. Serve immediately. I love Aussie Eggs Benedict but I have never made them at home I always have them at my favourite Bondi Beach Café (The Lamrock Café) on Sundays after my ocean swim. This challenge had many firsts for me, I have never made poached eggs, muffins or Hollandaise sauce before so I was very excited by this challenge. Aussie Eggs Benedict has a thin layer of vegemite spread onto the muffin before the bacon, poached eggs and Hollandaise sauce are added. 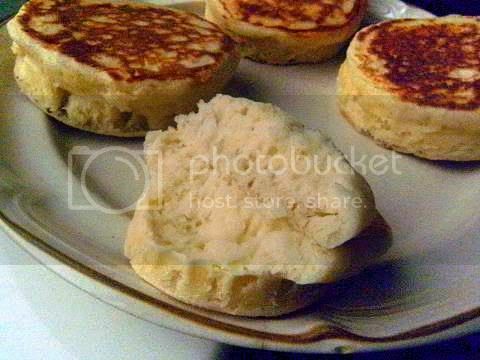 I decided to make home-made English muffins also, these muffins are easy and fast to make at home and I love them giant-sized 4”x1¼” (100mmx30mm). The muffin recipe below produces light fluffy muffins perfect for Eggs Benedict. The Hollandaise sauce was easy to make, I added a dash each of onion powder, garlic powder and dry mustard powder to the sauce. 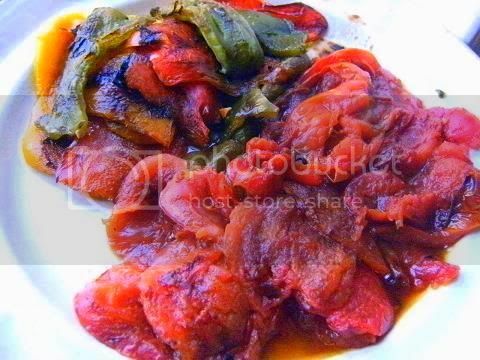 A big tip is if the sauce is starting to curdle or separate immediately remove the sauce from the heat. Add an ice cube to the sauce to stop further cooking, and beat the sauce vigorously with a whisk. Remove the ice cube as the sauce pulls back together. Continue whisking. If that doesn't do the trick, whisk together 1 egg yolk and a pinch of dry mustard in a separate pan. 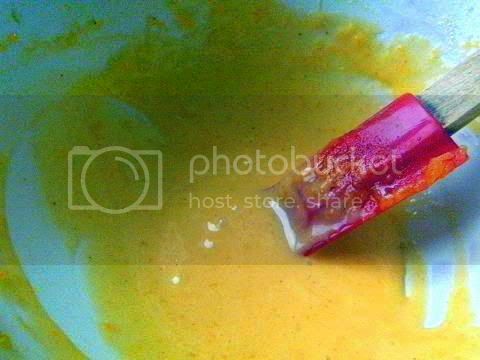 Gradually whisk in the curdled sauce to restore the emulsion. Serve immediately. I also used a combination of bacon and Chinese sausage yum yum. The final Eggs Benedict were even better than the café version I thought the home-made muffins and Hollandaise sauce made all the difference. In Australia our egg yolks and butter are very yellow this is why the sauce and poached egg is so yellow. 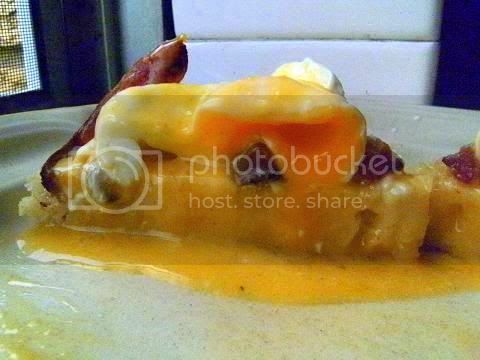 The Hollandaise sauce is superb so tasty and so rich. At my favourite café Aussie Eggs Benedict costs $10 per serving, the total cost for 4 servings of the challenge recipe using giant muffins, vegemite, extra large jumbo eggs, bacon and Chinese sausage (I reckon that each serving was twice as much as the café version) was $2.88 or $0.72 each. (I still have 3 giant muffins left!) and the total time to make the recipe was a little under one hour. 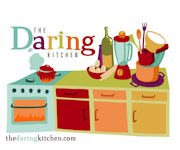 I have to admit I just love this challenge and it was so much FUN to make since I love the recipe and I learnt so much about poaching, making muffins and making Hollandaise sauce. In a bowl combine the powdered milk, 1 tablespoon of sugar, 1/2 teaspoon of salt, butter, and hot water, stir until the sugar and salt are dissolved. Let cool. In a separate bowl combine the yeast and 1/8 teaspoon of sugar in 1/3 cup of warm water and rest until yeast has dissolved. Add this to the milk mixture. Add the sifted flour and beat thoroughly with wooden spoon. Cover the bowl and let it rest in a warm spot for 15-30 minutes until a few small bubbles form on the top of the batter and the batter becomes very sticky and thick. Preheat the griddle to 300°F/150°C. 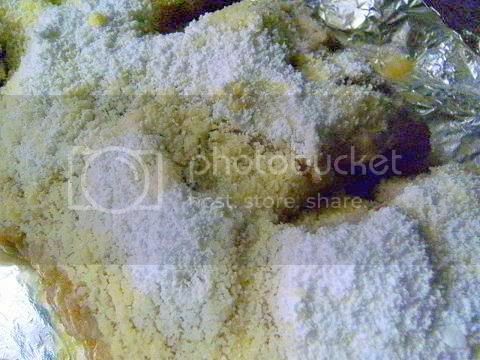 Add the remaining 1/2 teaspoon of salt to mixture and beat thoroughly. Place 4” (100mm) metal rings onto the griddle and coat lightly with vegetable spray. 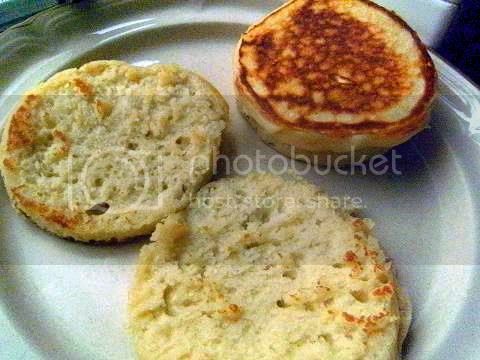 To test the temperature of the griddle place a tablespoon of batter onto pan the bottom of the small test muffin should brown in about 5 to 6 minutes. 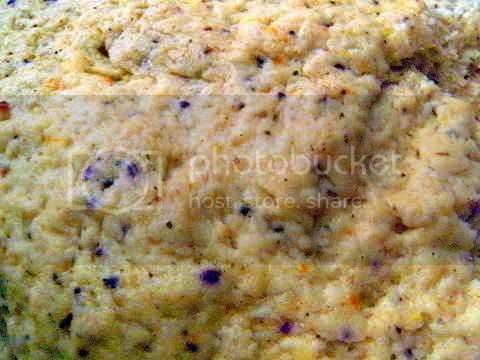 For the giant muffins place ½ cup of batter into each ring and cover with a pot lid or cookie sheet and cook for 5 to 6 minutes. Remove the lid and flip rings using tongs. Cover with the lid and cook for another 5 to 6 minutes or until golden brown. 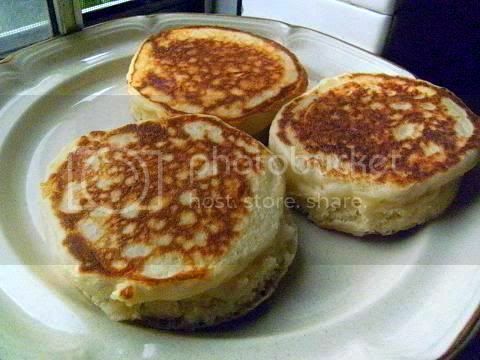 For regular muffins place ¼ cup of batter into 3” (75mm) rings and cook for about 5 minutes each side. Place on a cooling rack, remove rings and cool. Split with fork and serve. 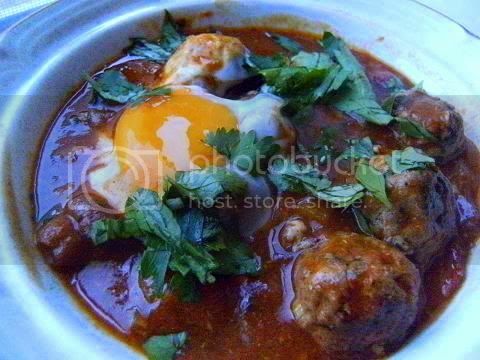 I decided to make a fiery poached egg dish from Morocco that uses merguez (spicy lamb) meatballs with charred grilled (fire-roasted) tomatoes, charred grilled capsicums (bell peppers), red kidney beans the dish uses three spice mixes. Also I decided to home-make all the spice mixes (harissa, ras el hanout and the merguez spice mix) and the merguez meatballs. It looks so pretty and tastes so delectable perfect for that special lunch. One for the lovers of spice and chilli heat, the poached eggs add a lovely coolness to the fiery dish. The home-made ras el hanout is superb I could eat it straight from the mortar and pastel a wonderful heady mixture of yumminess, if you wish you can leave out the harissa and just have a delicious exotic spice dish. Ras el hanout is a wondrous mixture of spices that is just delicious it can have up to 100 ingredients my recipe has 17 spices and herbs. Remember to make a huge batch and freeze the leftover mixture. Harissa is a fiery paste made from chillies, garlic, oil, coriander, cumin and caraway it is very very hot and delicious use sparingly. The merguez spice/herb mix has two types of paprika, cumin, pepper, cinnamon with coriander (cilantro) stems and roots with parsley stems. The house smells wonderful for a few hours after cooking this dish. 1. Heat the olive oil in a large frying pan over medium heat. Add the onion and sauté until golden. Toss in the garlic and cook another 2 minutes. Add the merguez meatballs and sauté until almost cooked through, about 3 minutes. 2. Lower the heat to medium-low and add the Ras el Hanout, Spanish smoked paprika and salt. Stir to combine and cook for a minute to lightly toast the spices. Add the tomatoes, capsicums and beans. 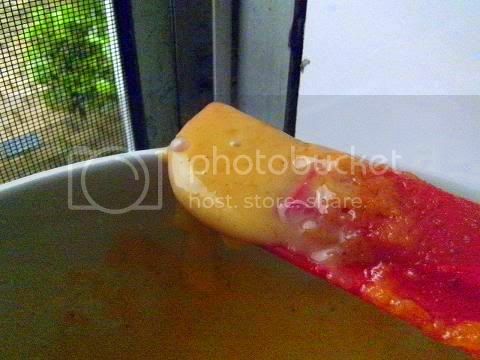 Turn up the heat to medium and cook until the mixture has thickened slightly, about 5 minutes. 3. Crack the eggs over the mixture, cover and cook until the whites set, but the yolks are still soft. 4. 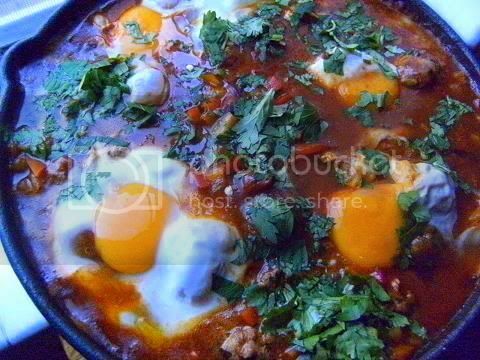 Spoon the ragout into four warm bowls, top with two eggs, a sprinkling of coriander (cilantro) and a ½ teaspoon of Harissa. 5. Serve immediately with crusty bread. “Ras el Hanout” ( "top of the shop" ) is a spice mixture from Morocco that can contain anywhere from 10-100 different spices. There is no definitive set combination of spices that makes up Ras el hanout. Each shop, company, person would have their own secret combination containing over a dozen spices. Typically they would include cardamom, clove, cinnamon, ground chili peppers, coriander, cumin, nutmeg, peppercorn, and turmeric. 1. Mix all the spices together. 2. Store in an airtight container. In a small bowl, combine all the spices and mix well. Set aside. 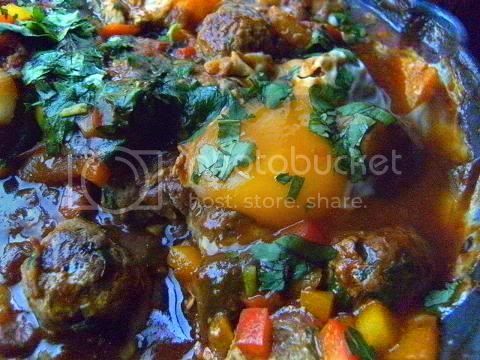 In a bowl medium-large, combine the lamb, Spice Mix, water, sherry vinegar, garlic, parsley, coriander (cilantro) and garlic. Wet your hands with water, and knead to mix thoroughly. Pinch a small piece of the lamb mixture and cook in a little olive oil to check for seasoning. Adjust as necessary. 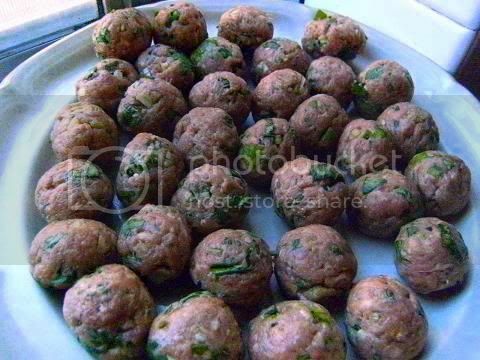 Divide the mixture into one tablespoon portions, and roll into a meatball shapes. Over medium-high heat, add a little olive oil to a medium fry pan. 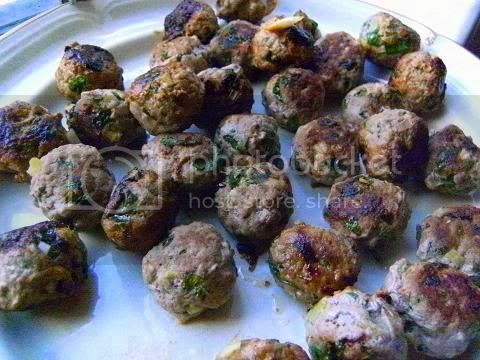 Add the meatballs and cook until golden on one side, then roll the meatballs so they cook evenly. They are best cooked to medium doneness. alternatively, you can grill the merguez meatballs to desired doneness. Set aside and keep warm. I had to do a confit (oil poaching) recipe, I researched on the internet and only found the normal (i.e. a little boring) recipes. So I thought that I would wing it and make butter-poached beef spare ribs. I was extra lucky the butter and the beef spare ribs were on special 50% off. 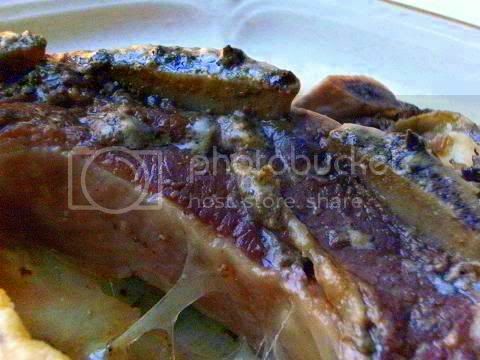 Total price of this recipe was $10 (serves 12 people, weight of ribs 2½ kg (5½ lb)). I made sure that the temperature was at 60°C (140°F) the lowest temperature for poaching meat safely. The recipe is so simple. No need to salt/herb cure the ribs before poaching. The butter flavour infuses the fat of the beef ribs and makes them so so tasty while the confit cooking method intensives the beef flavour in the meat so the final result is so so delicious. Preheat oven to very cool 60°C (140°F). Gently melt the salted butter in a heavy based Dutch oven. Place butter and the beef spare ribs into the Dutch oven and poach for 18 hours. What a miraculous result I wish I could photograph brown meat well, the colour of the beef was still pink(ish) even after 18 hours of poaching. The meat was so mouth-wateringly tender a spoon was enough to 'cut' the meat. 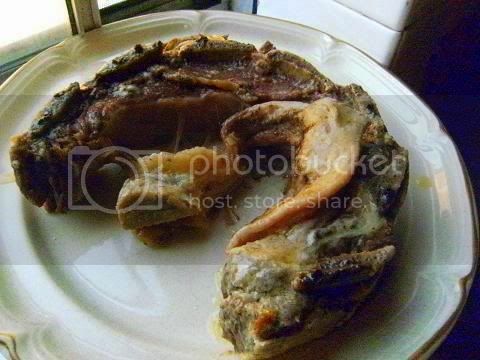 The meat was intensely beef-flavoured and the fat in the ribs was too delicious the butter-flavour infused into it. I'm usually a bit of a rib glutton but this version was so delicious and filling that I could only have a small portion.